All words from the romance genre ~ "A Rendezvous with my Sweetheart, who is sweeter thinks I'm sweeter than Honey." Revlon Just Bitten Kissable Balm Stains have caused quite a stir lately, and today I'll be the one stirring- with 3 colorful ladles. Honey 001 ~ It's a dusty pink shade that could look mlbb (my lips but better) on some people. It's the kind of lippy that goes with everything. Sweetheart 025 ~ Fuchsia pink. There's something about this color, it looks good on everyone. I have to send one to my cousin sister because she liked it so much when she tried it. I find that the finish is a tad different from the other 2- it's smoother, and makes my lips look a lil' bit plumper. Rendezvous 040 ~ A true orange shade. It's almost exactly the color of the orange Cadbury Gems. It's a color that always stands out. Although I don't wear it much, I know I'll miss it if I don't have it. Are they long-lasting? Oh, yes. Once, I went to an Indian buffet restaurant, and I didn't really need to re-apply afterwards. How do they smell/taste? They smell like peppermint. When I first tried these at a Boots in Newcastle, I was put off by the strong pepperminty scent that flew from all the testers on the shelf, because I don't like peppermint very much, I prefer Spearmint- especially with chewing gum (Hello, Wrigley's!) But when I wear them, the scent is almost non-existent. They are tasteless. Do they really stain? Yes, they do. It took me this long to swatch them, because I had to swatch them on separate days. I couldn't apply one after another on my lips because they left a stain that stays on till the next morning. Do they moisturize lips? They do, but when they wear off into a stain, you'll need a lip balm to prevent that stiff feeling. Okay, what else? Oh, packaging? Very cute. I LOVE that all the shades have their very own matching outfit. Only bad thing is, the silver writing rubs off. I've seen plenty of brands coming out with crayon lippies, but I think Revlon's design & packaging is the best, I prefer colored caps to the silver ones. 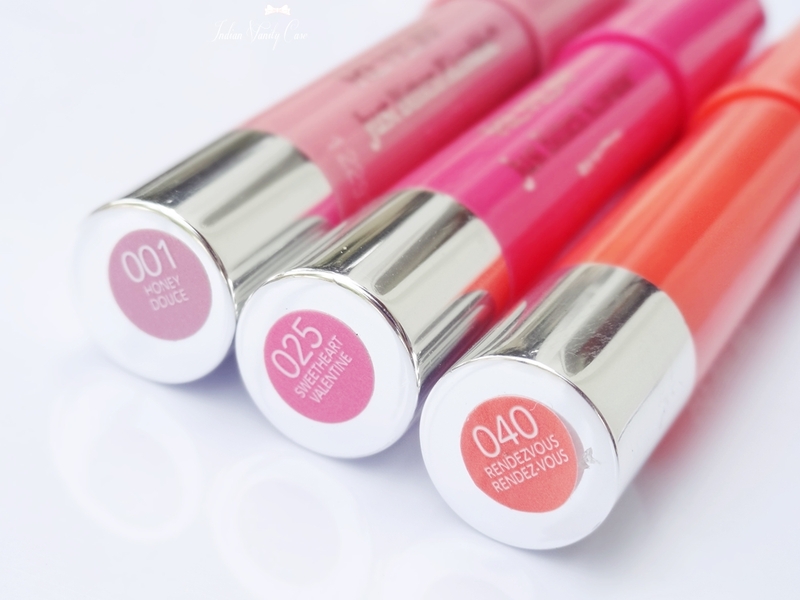 Are they better than Clinique Chubby Sticks? Without a doubt, YES. They are more pigmented, they last longer, they smell better (Clinique ones are supposed to be fragrance-free, but I get a certain wax/oil smell that I don't like), and they're cheaper. My review on Clinique Chubby Stick in Super Strawberry here. Sweetheart ~ ♥♥♥♥♥ 4.9/5. Look at the lip swatches, and you'll understand why. Disclosure: Products in this post were sent to me by brand for review. This review is based on my own experience with the products, and all opinions are my own, as always. I want honey douce badly!!! I have all three of these colours and I loveeee them. Honey is my favourite though, I must say! I still haven't bought any of these. I tried it in the counter but its too sheer for my liking. I like very pigmented bright colors lol. how 2 buy these stains? I literally just swatched Honey today in stores. I am still hesitant about trying this because I keep hearing mixed reviews on this! Oh u made me want these! You're right, I love the stain Honey leaves too! These lip stains are amazing and so addictive.. I recently bought the sweethear but now need a more subtle shade.. think will buy Honey!